Definition at line 1817 of file btrfs_drv.h. Definition at line 122 of file ldrtypes.h. Definition at line 121 of file ldrtypes.h. Referenced by LdrpHandleOneNewFormatImportDescriptor(), LdrpHandleOneOldFormatImportDescriptor(), LdrpInitializeProcess(), LdrpLoadDll(), LdrpLoadImportModule(), LdrpRunInitializeRoutines(), LdrShutdownProcess(), LdrShutdownThread(), and LdrUnloadDll(). Definition at line 226 of file ntddk_ex.h. Definition at line 222 of file ntddk_ex.h. 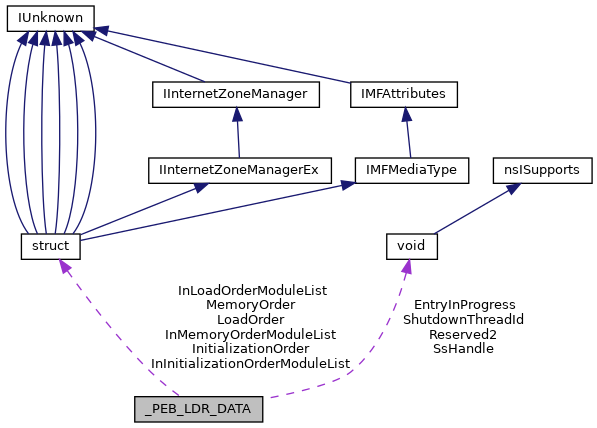 Referenced by LdrpInitializeProcess(), and test_InMemoryOrderModuleList(). Definition at line 119 of file ldrtypes.h. Referenced by DbgkpPostFakeModuleMessages(), EnumProcessModules(), GetModuleFileNameW(), InitExeName(), KiPrepareUserDebugData(), LdrpInitializeProcess(), LdrpInsertMemoryTableEntry(), LdrpMapDll(), PsaEnumerateProcessModules(), RtlpQueryRemoteProcessModules(), test_InMemoryOrderModuleList(), and UserpGetClientFileName(). Definition at line 1820 of file btrfs_drv.h. Referenced by FindModule(), LdrFindEntryForAddress(), LdrpInitializeProcess(), LdrpInitializeThread(), LdrpInsertMemoryTableEntry(), lie_about_fs_type(), and test_InMemoryOrderModuleList(). Definition at line 221 of file ntddk_ex.h. Definition at line 224 of file ntddk_ex.h. Definition at line 225 of file ntddk_ex.h. Definition at line 1818 of file btrfs_drv.h. Definition at line 1819 of file btrfs_drv.h. Definition at line 124 of file ldrtypes.h. Definition at line 125 of file ldrtypes.h. Definition at line 118 of file ldrtypes.h. Definition at line 223 of file ntddk_ex.h.